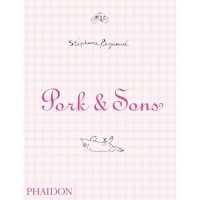 From it’s charming pink cover to it’s whimsical line drawings and photographs Pork & Sons by Stephane Reynaud is a perfect mix of authority and humour on a culinary staple dear to many a chef. Many cooks love pork for its versatility, efficiency and most importantly, flavor. From its many forms in charcuterie, to roasted, cured, smoked and baked, pork is the world’s most widely eaten meat. Here is an authentic and wonderful cookbook that finally honours the humble pig. In Pork & Sons author and restaurateur Stephane Reynaud takes us to visit his family and friends that for generations have been celebrating the rearing and preparing of pork for their tables. Pork is in his blood and his is an affectionate and experienced relationship with this culinary delight and his reverence and respect for the pig is admirable. This is a highly personal book with a glimpse into a day-in-the-life of a small family farm in rural France. It is at once playful and humorous and celebrates the community and family in Reynaud’s culinary life. We meet a charming cast of characters who both influence Reynaud and partake in getting the pork into his pot. The 150 recipes in Pork & Sons include chapters on ham, pates and terrines, sausage, roasting, barbecuing, entertaining and wild boar. This is real full-flavored, home cooking, not showy restaurant food and each dish with an accompanying photograph is presented in a simple, easy to follow manner guaranteeing succulent success every time. The selection is a true tribute to the versatility and downright delicious flavours of the pig, from the Barbecued Suckling Pig to Proscuitto, Arugula and Parmesan Crostini there is a wealth of recipes for which you to enjoy your pork. Completely unpretentious, Pork & Sons is an affectionate tribute to all things porcine. A must have for any meat lover. A unique, fun book that informs as well. Format reminds me of Creole. Cheers, Michelle.